The PSNI’s top cyber security specialist, Detective Chief Inspector Douglas Grant, says the force has enlisted the help of experts to ensure local hospitals are resilient enough to deal with large scale ransomware cyber-attacks like the one that took down NHS computer networks across England and Wales on Friday. He said: “Since this attack occurred on Friday afternoon (May 12), we have been working with representatives from the national government, National Crime Agency, National Cyber Security Centre and cyber security experts to put in place mechanisms to mitigate the risk to systems in Northern Ireland. 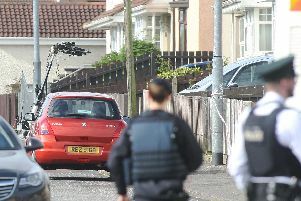 He said the PSNI is supporting a UK-wide co-ordinated response to the alarming incident. DCI Grant encouraged all local businesses and public services to take steps to protect their systems and reduce their vulnerability. “Do not open emails from unknown sources or containing suspicious links or attachments. Ensure that all computers on your network are fully updated with the latest ‘patches’. “A ‘patch’ is a piece of software designed to update a computer program or its supporting data, to fix or improve it. This includes fixing security vulnerabilities. “We would also recommend that businesses and industries join the local Cyber Information Sharing Partnership (CISP) so they can receive the most up to date threat and mitigation information to help protect their cyber security,” he said. Any organisations who believe they may be victims of cyber-attack are urged to contact to the police immediately at 101 or via the Cyber Crime Reporting Portal on the PSNI Website or alternatively through Action Fraud 0300 1232040.